At last, Ruth Burgess’s new book Winter is about to be delivered to our distributor’s warehouse. Thanks to all who ordered it in advance. It will be sent out to you very soon. We also have a new all-age download for you this week on the theme of love and the story of the Prodigal Son. Digital download: An all-age service exploring the different meanings of love and the story of the Prodigal Son. It also includes one of Nancy’s Fergie the Frog stories and a symbolic action involving paper, scissors and an amazing expanding heart, demonstrating how hearts can stretch to include other people. (There is a link to an online video giving practical guidance for this activity). Digital download: A hymn for Advent – words only – to be sung to the tune ‘Little Cornard’. 1 page, 4 verses. Digital download: Eight plays taken from the book Hay & Stardust, by Ruth Burgess. 64 pages. Digital download: A Christmas Communion liturgy from Iona. 7 pages/25 slides. 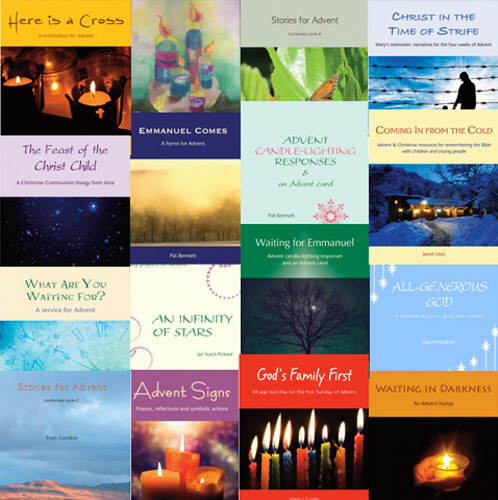 Digital download: A programme of suggested Bible readings and short prayers for Advent and Christmas that will help you create a few minutes of reflection for each day of this season. 16 pages. Digital download: The Christmas story as told by cats, with a piece for each day from December 1st, taken from the book Candles & Conifers by Ruth Burgess. 12 pages.